Another Food Review with Openrice! And this time, it was GELATO! I dragged Guan Ren along, as we have been wanting to try out Stickhouse Gelato for quite a while. "Stick to Goodness, Without the Guilt!" 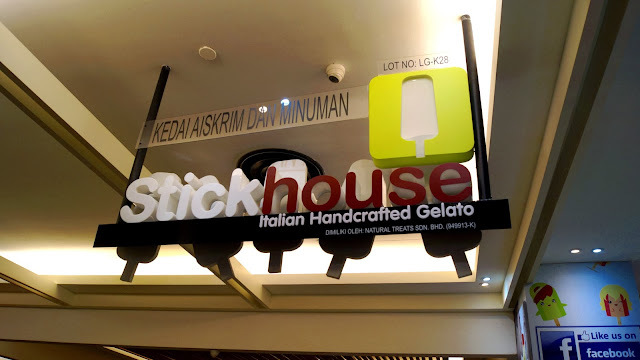 Stickhouse, hailed all the way from Italy, carries a new innovative healthy gelato concept which suits my agenda of trying to eat clean =b Why so? Because Stickhouse Gelato are produced using only natural & genuine ingredients without the addition of artificial flavouring, colouring or preservative. Stickhouse serves up to 20 flavours in Malaysia, with seasonal flavour popping out time to time. Apart from the usage of healthy ingredients, the technique Stickhouse uses in the production of their gelato also makes a huge difference too. Most ice-cream manufacture adds air to increase the volume of their frozen dessert. In fact, the air added into ice-cream can go up to a whopping 120%! The quality and natural flavours of the frozen desserts are deteriorate, as a result. After you've picked your gelato flavour, pick your desired chocolate dip and toppings! The pricing for the toppings is RM3 for full dip/coat, and RM1.50 for half dip/coat. Weight watchers & health-conscious ones, don't fret! As Stickhouse only uses high quality chocolate which are deemed a "heart friend" due to its ability to keep your cardiovascular system healthy! The yogurt was smooth & velvety. Really creamy and goes so well with the chocolate & nuts! Feels like I'm taking a bite of heaven yumm! As zero air is added into the Stickhouse's gelato during the manufacturing process, the gelato produced is much denser & creamier than regular ice-cream! You can see how dense the Strawberry yogurt is from the pic! (: Each bite delivers a full punch of strawberry goodness. I got a little jelak of the chocolate so I decided to try out a gelato without any toppings/dippings. The grape flavour tasted really grape-ish & real. It felt like as if I am eating frozen grapes, on a stick. You can see the grapes fiber inside the gelato too! Creamy with an aromatic vanilla essence, this flavour won my heart on the first bite. The crunchy macadamia was a contrast to the smooth velvety texture of the gelato. The gelato I had in the pic above was Gianduia drenched in Dark Chocolate with Macadamia toppings . Gianduia is my personal favourite on that day, and also the manager's pick! Gianduia is the only original flavour that you could get from the main ranch of Stickhouse @ Italy. It is basicaly a mix of hazelnuts & chocolate . If you're a fan of Ferrero Rocher this is certainly a must-try! Of course, it is not compulsory to completely dip your gelato in chocolate! You can choose to just dip half of your gelato in, or drizzle a little chocolate onto your gelato. 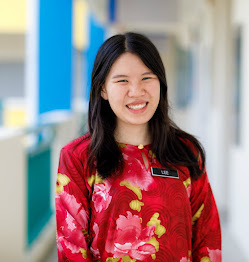 The professional staffs at Stickhouse would be glad to comply to your wishes! Stickhouse is introducing a seasonal flavour, in conjunction to Christmas, that is CHOCOLATE & CHEESECAKE FLAVOUR! Shaped like a Christmas Tree & decorated with chocolate & nuts like the ornaments, this gelato will be on sale from the 15 of December! Grab yours before it runs out of stock!